In order to combine the offerings of several suppliers, marker lamps are separated here into several smaller categories. As best as possible both the lamps and their mounting accessories will be found under each section. Most marker lamps are going to be surface mounted (raised not flush). Some lamps come with an integral mounting base like the Grote Turtleback. Others like the Truck-lite 19 series need a separate mount. Each lamp also needs a pigtail. Clearance marker lamps are offered with three types of "optics". Paraphrasing the words of Truck-lite’s training guide - a ‘P2’ rating is the minimum standard for clearance, side marker, or identification lights. All Truck-Lite devices meet this standard, even if they are marked PC, P3, etc”. At Plaza all clearance marker lamps have at least the P2 rating. Beyond the 'P2' level there is 'Reflex' capability and a 'PC' rating. By dispersing the federally required amount of light in a range of 180 degrees, ‘PC’ lamps can legally function as two lamps when mounted at a 45° angle at the corner (most often the front) of a trailer. This rating may also require more energy. A ‘PC’ rated light can be used anywhere a ‘P2’ light would have been used, but the reverse is not true. "Reflex" is the capability to reflect light aimed at a trailer, Lamps with this capability say they come with a built-in reflector, that is, a reflecting surface. Federal conspicuity requirements can be met with reflective tape but also with “reflex” reflectors built into clearance and marker lamps. There are slightly conflicting goals between a PC rating and a reflecting capability since the reflecting surface can obstruct the light trying to be emitted from the lamp. Grote does not attempt to offer a lamp with both features. Most often in any lamp series you will find more than one part number offering these levels of optics. This category of lighting may have been called the "21 series" at one time but Grote’s Turtleback design dominates at Plaza. The base of these lamps measures roughly 2 x 6". The biggest seller is the Supernova LED Turtleback followed by an incandescent Turtleback featuring two replaceable 12,000 hr. bulbs. Still another 2-bulb incandescent Turtleback is sealed with even a lower cost. All of these Turtlebacks are male-pin lamps using Grote's advanced double-seal female plug pigtails. Lamps in this size range are roughly half the width of the larger rectangular (Turtleback) markers with the LED versions being the narrowest. Grote’s Supernova 3” Thin Line is the biggest seller with PC and non-PC versions, a replaceable lens, and their best double seal pigtail. Having a replaceable lens makes good sense for this lamp because, with the durability of the Supernova line and the advanced pigtail connection, the only problem you are likely to ever have is a cracked lens. Truck-lite’s LED 35 series (not PC rated) is the competition with a width 1/8” thinner than the Supernova but the lens is not replaceable. It is still a popular lamp. Truck-lite’s 19 series male pin 19200 and Grote’s 46742 & 46743 2-bulb sealed incandescent lamps are good low-cost alternatives that require a surface mount that also provides a hot wire pigtail. The most popular 2.5” round marker at Plaza is the Grote LED Hi Count series. Having neither a built-in reflector nor a PC rating, it does have an appealing diode design and offers an easy upgrade path from incandescent. The competition is the Truck-lite LED 10 series which requires the use of the a Truck-lite Fit n Forget pigtail. The big selling incandescents are the Grote 45812 and 45813 which are sealed lamps with a 12,000 hr. bulb, a PC rating, and use a twist-on mount (plus others). In this size range LED lamps again are outselling incandescents. The top two incandescent lamps are both sealed, PC-rated lamps with female connectors using the older male PL10 pigtails. Truck-lite’s version (30200R/Y) has a 15,000 hr. bulb life and Grote’s (45822 & 45823) has a 12,000 hr. bulb, but the Grote lamp is more popular. Two possible reasons for this are that Grote’s lamp is somewhat less costly and Grote also offers a double seal pigtail (67001) for this lamp. Grote’s 9 diode Hi Count LED is the most popular of all of the 2” lamps. It is a female connector using either the single seal PL10 pigtail or the double seal version which makes an easy upgrade from an incandescent lamp. Truck-lite’s 30250R/Y LED lamps use their advanced Fit n Forget pigtails and are compatible with 24 volt as well as 12 volt systems. With improvements in LED technology it was inevitable that a single LED would be able to get the job done. Both Grote and Truck-lite now offer single LED marker lamps at 1" diameter that are thinner and smaller than the 2” round lamp and narrowest rectangle. Pigtails come attached to the LED but a grommet is necessary to fix the LED to the mount. What Grote calls "dual intensity" for their 3-wire 49363 is the capability for the single diode to be used as an auxilliary turn lamp. Grote 49322 Single diode marker lamp with grommet & .180 male bullets. Yellow 49333 also in stock. Grote 49363 is yellow dual intensity LED marker (red version shown above) able to be used for auxiliary turn function. 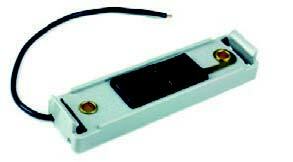 Grote 42270 mount for single diode LED lamps. The tried and true incandescent lamps with replaceable bulbs are still in demand and can be found in this category. 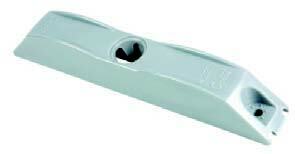 The Grote Square Corner series measuring 4” x 2” with attached bare-wire pigtail is a big seller. The LED Square Corner has 13 distinctive diodes and a replaceable lens. The incandescent 46782/3 and 46792/3 are PC and P3 rated. Truck-lite’s new Flex-lite model, 36115Y and 36115R, is a 3-diode LED lamp that is making a new category for itself by using a heavy duty adhesive for mounting. The lamp has the long life and attractive appearance of an LED but may also be the most theft resistant lamp yet created due to the strength of the adhesive. Click here to see our entire stock of clearance marker lamps, pigtails, lenses, and mounts. Grote's Square Corner series includes a 13-diode LED and incandescent lamps with replaceable bulbs. Flex-lite from Truck-lite is a 3-diode lamp attached with high strength adhesive. There are many appealing marker lamps but the quality of the wiring connection may be the most important factor in minimizing maintenance costs. LED lamps by themselves have a long life and the electrical connection should be equally long lasting. Lamps originally may have used female connectors requiring pigtails with male "plugs". But the current thinking at Grote, at least, is that it is the pigtails that should have the female connector or plug to insure reliability. Therefore if you do not want to be trouble-shooting lighting problems in the future, you will be wise to select an LED lamp with an advanced sealing plug. Peterson Manufacturing, rather than designing their own pigtails, has chosen to use the respected AMP line of sealed plugs for pigtails on its US-made Piranha LED 2.5" and 2" round markers. AMP Hardshell Pigtail with .180 bullets is used for clearance marker lamps from Peterson Manufacturing. Pigtails enable a lamp to be replaced when defective without affecting the wiring. There are a large number of pigtail part numbers but the plug designs on this page are the foundation for nearly all Grote pigtails. 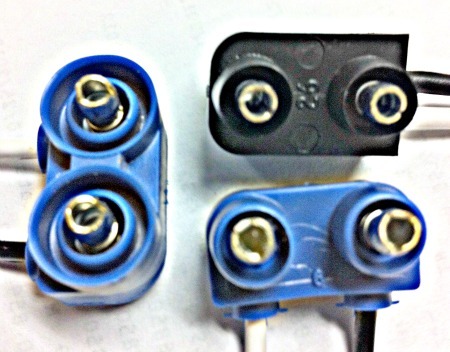 If one of these plugs is not called for, then Grote usually has "hardwired" a bare wire pigtail. This is a very reasonable solution if the lens can be removed and the lamp bulbs replaced without replacing the entire lamp. Note that a pigtail may be nothing more than a single "hot" wire when a ground wire connection to the chassis is achieved through the screw that attaches the lamp to the chassis. Pigtail plugs for clearance markers are all "right angle" meaning the wires exit at a right angle from the pins due to the space limitations for marker lamps. While Grote promotes their double seal design for the LED lamps of the future, they also make it easy to upgrade to LED lamps from incandescent. For example, popular Hi Count LED lamps have female pin connectors requiring male pin plugs, the design used by most legacy incandescent lamps. Either the double seal or single seal pigtails can be used for many female pin lamps. Above image illustrates the difference between a single seal and a double seal clearance marker male pigtail plug. The double seal ring surrounds the lamp’s sealing ring and the single seal ring is inside of the lamp’s ring. Black plug is Truck-lite’s 94902 which is a single seal plug. At the left is Grote’s Double Seal 67001. At bottom right is Grote 67050 single seal. Series 19 female plug for male pin lamps - comes with pigtails 66980 66981 66982. A Truck-lite PL-10 plug such as used with pigtail 94902. These plugs used for incandescent lamps.